An epitaph to Peter Smithard, Bespoke Tailor, Holbeck, Leeds R.I.P. Peter Smithard, Bespoke Tailor, Holbeck, Leeds R.I.P. 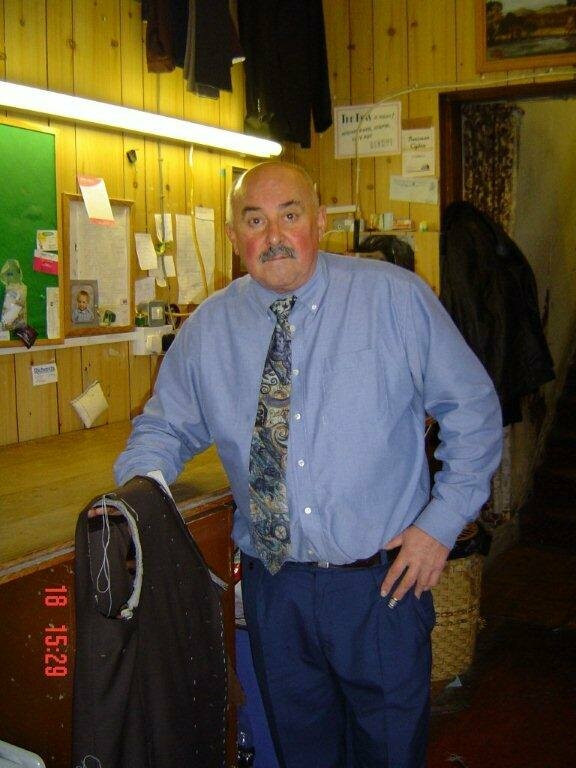 The late Peter Smithard, Bespoke Tailor of Holbeck Leeds photographed in his famous shop in Domestic Street and taken in 2004 - sent in courtesy of Sue Billam. 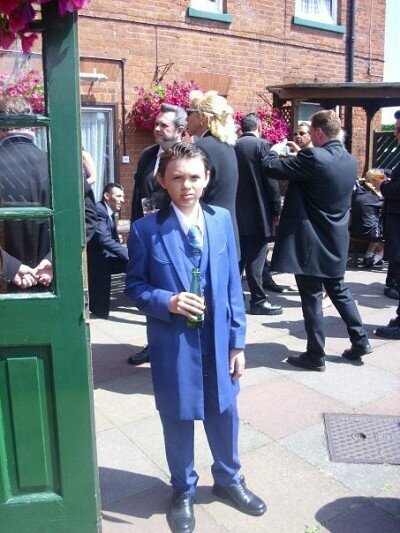 Nidge pictured in the Peter Smithard Blue Mohair suit at Stanhope Drive, Horsforth near Leeds in 2008. It is with great sadness that I have to announce the untimely death of a greatly respected friend of mine, Peter Smithard, Bespoke Tailor of Holbeck, Leeds. Peter sadly died on Monday 9th March 2011 at the age of 68 years. Peter was on holiday in San Blas, Tenerife and was taken ill on Sunday 8th March and later died on Monday 9th March 2011 in Hospital at Playa de las Americas at 7.20 pm in the evening. I first met Peter about five years ago after my friend Adrian Clayton, a fellow Teddy Boy recommended him to me after I had been looking for a decent tailor to make my Edwardian Teddy Boy suits. Peter was a down to earth no nonsense Yorkshireman which is why he appealed to me, part of that old school of old fashioned traditional tailors. He came from Holbeck and carried on in his fathers footsteps, who also was a Bespoke Tailor. Soon Peter and I became good friends and we worked well together and he always said that what he liked about me, was that I knew exactly what I wanted, which was a compliment indeed. I have always given Peter a sketch drawing and a specification for the suit that I wanted making and he said that he really liked that about me as then there was no ambiguity. I still, got the occasional phone call nevertheless! Peter has being tailoring Edwardian Teddy Boy suits for a large number of Teddy boys in Yorkshire and elsewhere for a number of years. 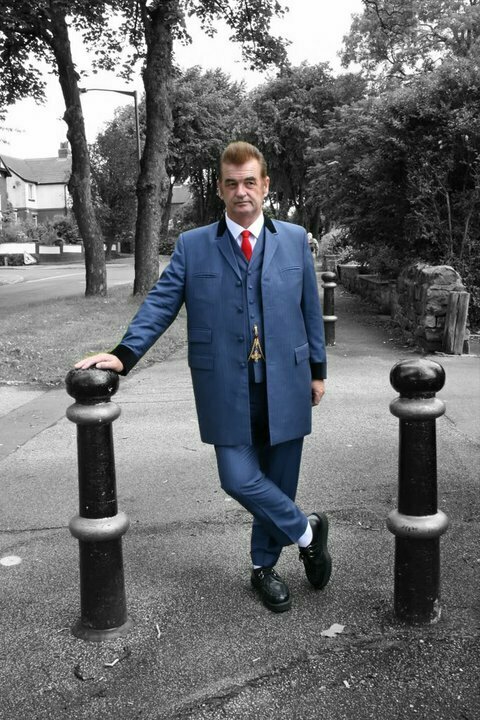 In fact my old friend and fellow Teddy Boy East End Mark used to travel all the way from Walthamstow in north-east London to get his suits made by Peter Smithard of Leeds. I used to travel to Holbeck from near Peterborough, so that tells you something about the man, that people would travel miles just to have a Peter Smithard suit. Peter had an eye for the cut of a suit that few tailors have and he would persevere until he got it right. He also made Mod suits and of course conventional suits. In a wardrobe of eight Teddy boy suits and two drape jackets and an overcoat, Peter made four full suits, two jackets and an overcoat not to mention the numerous pairs of trousers and waistcoats. Of all my suits and jackets - his suits and jackets are the best fit! 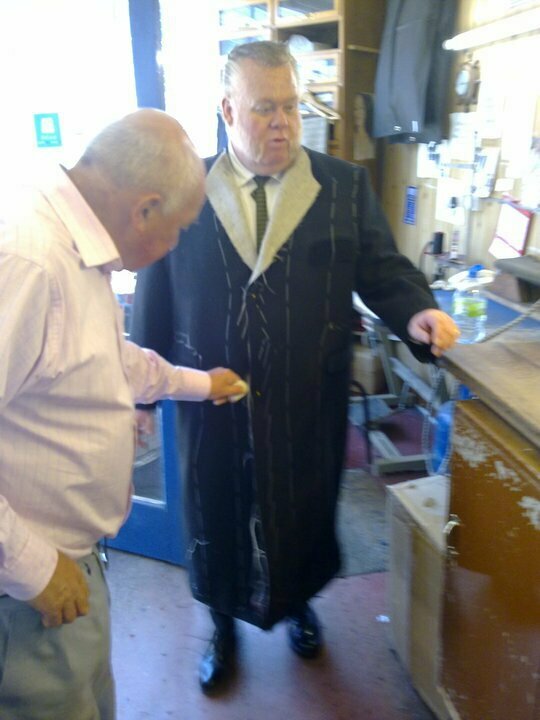 Peter Smithard undertakes a fitting of a Black Crombie overcoat for East End Mark in mid 2010. During 2009, it was noticeable that Peter seemed to be taking on too much work especially with the passing alteration trade which his assistant Alma Walker was mainly responsible for. I did say to Peter at the time, after he had taken nearly six months to make up a four piece light grey mohair Drape suit, that I felt that he needed to slow down and he was taking too much on, but he couldn't and he just kept going. He did say to me later that I was probably right and that maybe he should consider slowing down and he would probably do that when the lease on his shop finished in a year or so's time. He said that he would probably then start working from his home in Gildersome (located between Leeds and Bradford) and only have a few select customers and that he would be pleased to offer me and a few others that continued service. When he finally completed that mohair suit, he was so proud of it that he took some photographs of me in it. Johannes, my son in a Peter Smithard suit at the Tramways, Pakefield in 2009. When I picked up my four piece grey mohair in January 2010, I saw a grey herringbone overcoat with a black velvet collar on a mannequin in his window. I said "I like that overcoat Peter" and he said "John try it on it looks as though it will fit you" so I did and it fit perfect almost so that is it had been made for me. Peter told me that a businessman had ordered it and then had done a runner. He said "John would you like it, because if you do, its yours for £200.00" I said yes but I could not afford to pay for it now as I had just given him my final payment for the grey mohair. Peter said "Don't worry about it John - take it now and pay me when you can, I know that you will pay me." When I returned home, I showed the overcoat to my wife, Roseanne and she was convinced that this was a conspiracy and that Peter had tailored the coat for me as it fitted so well! The coat must be worth around £8/900 at today's prices - that tells you the type of great man that was Peter Smithard. Peter's work did not stop with me - it then spread to other members of my family - Peter made a 3 piece drape suit for my son Johannes in 2008 which he has now outgrown and has since been passed on to a close friend's son. He also made a dog tooth jacket with a black velvet collar for my daughter Rhianne in 2010, which she still wears with pride!. In the Peter Smithard Light Grey Pinstripe Mohair talking to John during Teds in Town 2, in London's West End in late July 2010. This was the last full suit that Peter made for me. In September 2010, I visited Peter at his premises in Holbeck, Leeds en-route to Manchester to visit our daughter Rhianne with my wife, Roseanne after Peter had just returned from holiday in Benidorm, Spain. The objective was to get Roseanne measured up for an Edwardian suit and also a fitting for me for a blue drape jacket, this happened. During our visit Peter said that he felt that he had picked up a chest infection and he had a cough, I also had a suit being altered. I phoned up to discuss something with him the following week only to get Alma, his assistant to tell me that Peter had been taken to hospital with Pneumonia. After visiting Peter's shop in Holbeck in October, immediately prior to going to the Ted Do in Scarborough to pick up my altered suit, Alma told me that Peter had suffered a heart attack whilst in hospital, I was stunned by this. I maintained contact with Alma and just before Christmas phoned Peter at his home in Gildersome near Leeds who although being discharged from hospital was still very weak. Peter had received a quadruple bypass operation 20 years previous After a treatment programme, Peter gradually got better and steadily started going back to his shop for a few hours here and there, which gradually developed into two or three days per week. He had a pace maker fitted and he then started to feel better. 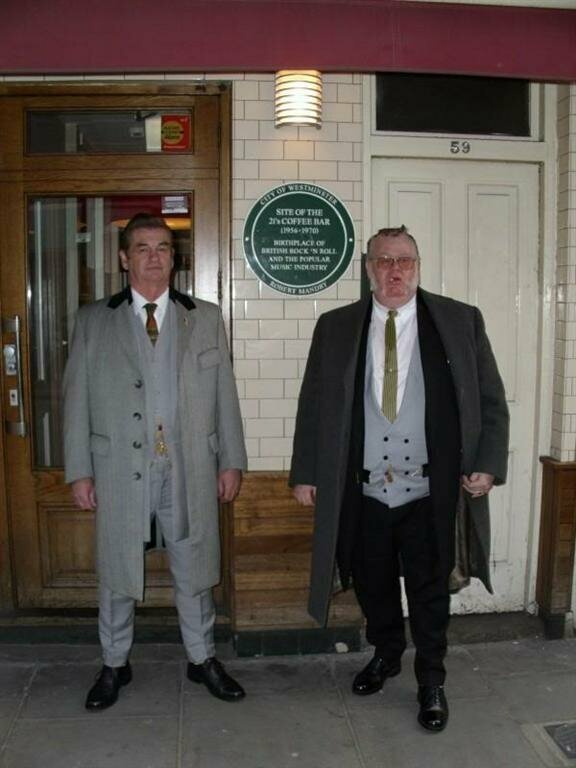 Wearing the grey Heringbone Crombie Overcoat and the light grey mohair suit outside the old 2I's in Old Compton Street, Soho with East End Mark in January 2010. After Mark saw this coat, he had Peter make him a Black Crombie, shown in the previous photograph. In February 2011 Roseanne and I visited Peter at his shop in Holbeck, for what would be the last time, on a cold winter Saturday morning finally to see him again after nearly six months. I found him wrapped up in a fur hat and jacket with his portable gas fire on full, he looked a little frail and was press ironing a waistcoat. He did another fitting for me and discussed with Roseanne about her suit and said that he would make the jacket and that Alma would make the skirt. We had quite a discussion and we talked about my new job and he confided in me that he was actually suffering from depression due to the cold dull weather, the fact that he had lost his mother last year and his recent illness. However he told me that he was going on holiday to Tenerife on the Tuesday and I told him that would hopefully make him feel a whole lot better and I agreed to phone him on his return. On the evening of Tuesday 8th March 2011, I was talking to a friend who told me that he had spoken to Alma in the morning and she had told him that Peter had gone back into hospital and may never work again. This prayed upon my mind and I decided to phone Alma on the morning of Thursday 10th January 2011 on my way to work near Cambridge only to be told that Peter had died - I was devastated and very upset and Alma agreed to tell me when the funeral would be, so that I could attend. On Friday 25th March 2011 at 10.00 am, Brian Nicholls (drummer of Phi Haley's Comments) Steve Moore and Linda and I attended the Funeral of the late Peter William Smithard at st Peter's Church, Gildersome, Yorkshire as Peter's friends and on behalf of all the Teddy Boys who chose Peter as their Tailor. We wore our Peter Smithard Drape suits with pride as a visual manifestation and appreciation of the skilled tailoring of such a great man. After the funeral we walked to the Griffin Hotel in Gildersome for the Wake where we talked to his best friend, John Quinn, Alma Walker and members of the Smithard family. Our sincere condolences go out to Peter's wife, Edwina and his children, Mathew and Claire and Peter's grandchildren, Luis, Alex, Marcus, Ella and Zak and his best friend of 20+ years, John Quinn. Well Peter never returned from Tenerife alive and sadly he is no more, however we will never forget this great craftsman of his art of bespoke tailoring and his memory will live on every time we all don our suits! Obituary published in the Yorkshire Post on 23rd March 2011. PETER SMITHARD March 9th suddenly, aged 68 years. Much loved husband of Edwina, loved dad of Claire and Mathew and loving grandpa of Luis, Alex, Marcus, Ella and Zak, also best friend of John. Funeral Service will take place in St Peter's Church, Gildersome, on Friday, March 25th at 10 a.m. prior to private family cremation. Family flowers only please. Donations in lieu would be appreciated for Take Heart. Enquiries to W. Kaye & Son. 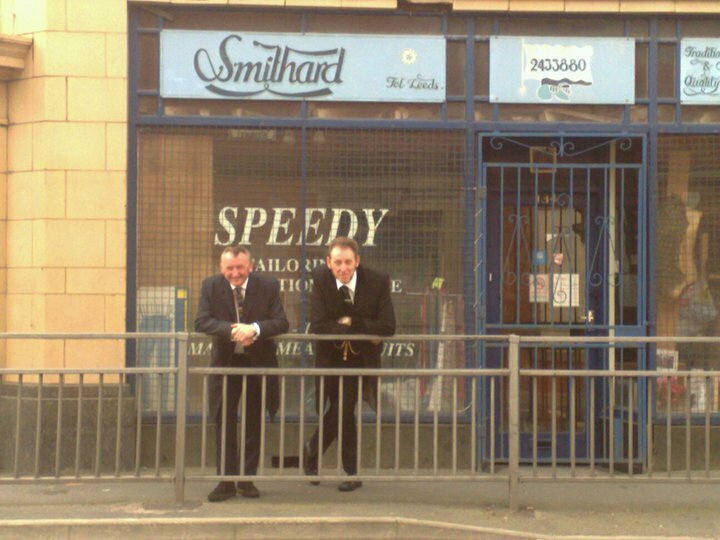 Brian Nichols and Steve Moore outside Peter Smithard's shop in Domestic Street, Holbeck, Leeds after Peter's Funeral. Peter Smithard's mother, Catherine died almost a year previous to Peter's death, he was very close to her and used to visit her every night after leaving his shop in Holbeck. One night he visited her home and the doors were locked and he feared the worst, so he called his best friend John Quinn who came round to help. Eventually the Police gained access and found her ill but conscious and talking, however she later died in hospital. Peter never really got over her death of his mother and he said as much to me prior to him going to Tenerife. Published in the Yorkshire Post on 28th January 2010. SMITHARD CATHERINE January 23rd suddenly in hospital, aged 94 years. Much loved mum of Peter, grandma of Clare and Matthew and great-grandma of Louis, Ella, Alex and Marcus. Funeral service and cremation will take place at Cottingley Hall Crematorium on Tuesday, February 2nd at 11 a.m. Donations in lieu of flowers if desired would be appreciated for Breast Cancer Research. Enquiries to W. Kaye and Son. Tel. 2705553.